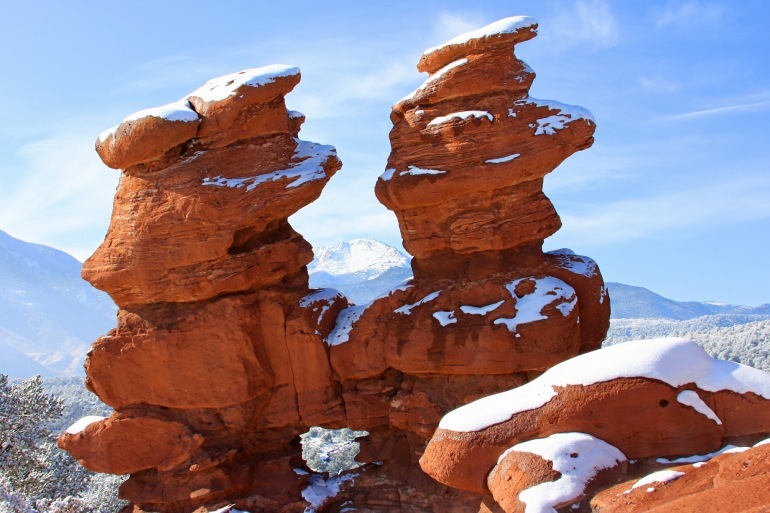 Garden of the Gods: Observe the breathtaking views of 300-foot-high sandstone rock formations against the backdrop of snowcapped Pikes Peak. Enjoy a trail walk and the newly renovated nature center and museum. Georgetown Loop: Depart from Denver on a spectacular stretch of three-foot narrow gauge railroad that brings you deep into scenic Clear Creek Valley. Silverton Narrow Gauge Railway: Ride this train for an unforgettable journey through the mountains to historic Durango. Cumbres and Toltec Scenic Railroad: Visit the village of Chama, New Mexico, and ride this historic train, which served the silver mines of the San Juans. Royal Gorge Route Railway: Follow the winding, tumbling Arkansas River and view the granite cliffs of Colorado’s Royal Gorge. Manitou and Pikes Peak Cog Railway: Ride to the summit of Pikes Peak, a National Historic Landmark rising over 14,000 feet, where you’ll marvel at sweeping vistas of the Great Plains, the Sangre de Cristo Mountains, and the Collegiate Range. Discover the breathtaking scenery of the Rocky Mountains from the windows of historic trains, travel to 19th-century mining towns, and learn about the region’s fascinating and colorful rail history. Individual arrivals in to Denver International Airport during the afternoon. Check in at the Westin Denver-International Airport. Gather for a welcome reception, opening remarks and dinner. This morning visit the Colorado Railroad Museum in Golden for a tour and introduction to rail history of the region. After lunch enjoy the first of many scenic railway rides, the Georgetown Loop Railroad (train journey: 35 minutes). Completed in 1884, the railroad’s circuitous route connected the mining camps of Georgetown and Silver Plume, two miles apart, with an elevation difference of 600 feet. Abandoned in 1939, the line was restored to operation in 1975 by the state historical society of Colorado. Next, drive to Vail Village – a great place to explore on foot. This evening enjoy dinner in the charming village. After breakfast we’ll drive through a region of Colorado rich in railroading history – including brief stops in Minturn and atop the summit of Tennessee Pass, the highest point on any mainline railroad in America. At Camp Hale we will see the training grounds of the Army’s famed 10th Mountain Division. Enjoy a visit to the Black Canyon on the Gunnison River, which was once part of the “Narrow Gauge Circle Route” now a national park. Drive on to Ridgway, the northern terminus of the Rio Grande Southern Railroad until 1951. This area is also the habitat of the Galloping Goose rail cars. Continue on to the final destination of the day, the charming western town of Ouray, nestled in the spectacular mountain scenery, known as the “Switzerland of America.” Check into your accommodations in Ouray. Beaumont Hotel or China Clipper Inn (overflow hotel). Shuttle to Silverton. After exploring and enjoying lunch at the restaurant of your choice in Silverton, board the Durango & Silverton Narrow Gauge Railroad for your afternoon trip through the canyon of the Rio de las Animas to Durango (train journey: 3 hours, 30 minutes). Arrive in Durango where you will have some free time to explore the charming shops and galleries of this charming mountain town. Enjoy dinner in Durango this evening at a local's favorite restaurant before shuttling to our hotel in Pagosa Springs. This morning we’ll drive to Chama, New Mexico, arriving in time to photograph the narrow gauge engine terminal and rolling stock in this hub of train operations. This train trip will include an ascent of the long, steep grade to 10,020-foot Cumbres Pass and will traverse the rim of Toltec Gorge during the day-long trip to Antonito, Colorado (train journey: 5 hours, 45 minutes). Our day ends in the town of Salida, where an inviting restaurant and comfy bed awaits. Step aboard the Royal Gorge Route Railroad this morning and experience stunning riverside landscapes, and 1,000-foot canyon cliffs. We’ll enjoy breakfast while on aboard. The scenic railway began as part of the original Denver & Rio Grande main line to Tennessee Pass (train journey: 2 hours). Continue on by motor coach to Colorado Springs and visit the Western Museum of Mining & Industry, a 27-acre indoor/outdoor exhibit site that features a ten-stamp ore mill. Tonight, we’ll stay in the world renowned Garden of the Gods Club and Resort. This evening enjoy a festive farewell dinner at the hotel. Z.G. Simmons, inventor of the Beautyrest mattress, founded the Manitou & Pikes Peak Railway in 1889. It’s one of only three cog railways in North America and ascends higher than any other in the world. In 1938, it began operating the world’s first internal-combustion powered cog railcar. See one of the steam locomotives it replaced. We’ll ride round-trip to the summit of Pikes Peak and back on an articulated train built in Switzerland (train journey: 3 hours). If you choose not to board the train you can explore the shops and town of Manitou Springs or enjoy the many amenities available at our hotel. Return to Denver International Airport late in the afternoon for return flights home after 7:00 this evening. For those who wish to overnight near the airport, we encourage you to stay at the Westin Denver International Airport which is connected to the terminal. Deposit of $800 per person (unless otherwise noted), per tour, payable by check or major credit card to Smithsonian Journeys is required to reserve a space on a tour. Deposits are applied to payment of the program price. Meals as indicated in the tour itinerary. Airfare and air and departure taxes. Cancellations after 7 days of booking: $800 retained (entire deposit).